"Many find carnitas a little dry or flavorless. These have a great, distinctive flavor and are requested by friends and family over and over. Serve with warm, fresh tortillas and salsa." Heat the vegetable oil in a large Dutch oven over high heat. Season the pork shoulder with salt, then arrange the pork in the Dutch oven. Cook until browned on all sides, about 10 minutes. Add the onion, garlic, lime juice, chili powder, oregano, and cumin. Pour in the chicken broth, and bring to a boil. Reduce heat to medium-low, cover, and continue to simmer until pork is very tender, about 2 1/2 hours. Transfer the pork shoulder to a large baking sheet, reserving the cooking liquid. Drizzle with a small amount of the reserved cooking liquid and lightly season with salt. Bake the pork in the preheated oven until browned, about 30 minutes. Drizzle more of the cooking liquid on the meat every 10 minutes, and use two forks to shred the meat as it browns. 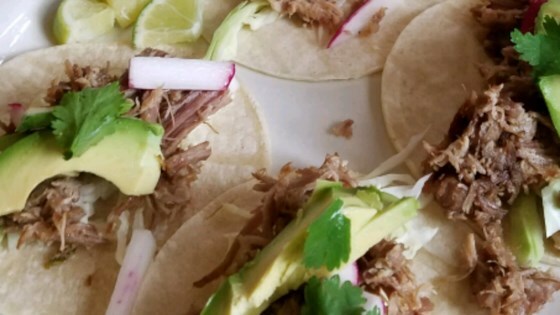 Make Chef John's perfect batch of tender carnitas today! Serve the carnitas with warm, fresh tortillas and salsa. Texture was perfect, but meat was waaaaay too salty. Salt overpowered the cumin and chili powder. 1 Tablespoon would have been plenty. Easy fix for an otherwise good recipe. I'm very happy with how our carnitas turned out! I used a tenderloin and substituted a dark beer for the chicken broth. Very tender and flavorful!